Genesis 1:3 Electrical is experienced in the needs and requirements of tenant electrical applications. When performing Commercial Tenant Improvements, commercial contractors & local companies turn to Genesis 1:3 Electrical’s professional staff for their electric needs. The professionals at Genesis 1:3 Electrical will see to it that your electrical job is done properly, safely, on time and up to code. Genesis 1:3 Electrical has been providing tenant electrician and electrical contractor services for years in the Denver Metro. We work closely with designers, architects and general contractors throughout the process. We can also help retailers with interior and showcase lighting to put their merchandise in the right light. Whether adding a new dedicated circuit for that new copy machine, or relocating the entire office to a new office space, we can handle the electrical work and make it look like we were never there. Our certified Commercial Journeymen will do the work in a quality manner with the least amount of interruption to your work environment. Your needs are important to us, and we understand that you need to get the job done fast and keep business rolling. We will get the job done. We are easy to reach. We will always answer the phone during business hours. if there’s an after-hours emergency we are available for help. If you have an emergency electrical situation, we handle it right away. Whether it’s as simple as flipping on a circuit breaker or whether troubleshooting is needed to find where bare wires are touching. We can send you experienced and knowledgeable electricians who will get the lights back on. We quote you prices in advance of doing work. If you want something new installed, we give you a price up front in writing once our electrician has seen the job. New installations include, for example, a new light fixture, a rewire of an apartment, an electrical panel upgrade, or installing any other new electrical equipment.If there’s something broken, like an electrical outlet that no longer works, we charge per hour for troubleshooting. However, within about an hour, our electrician will either have fixed it or will have figured out the problem and will give you a written estimate for fixing it. 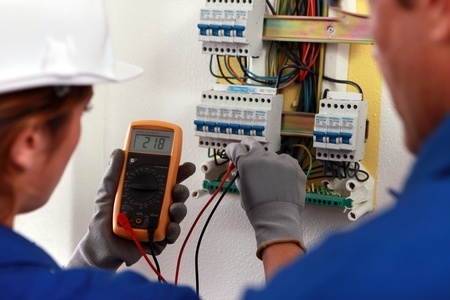 Our electricians have the judgment to give you accurate estimates. For example, the doorbell for one of your apartment units has broken. Even though door bells look small and simple, we know that, in this case, looks can be deceptive. Hunting for a short or loose wire somewhere in the walls could turn into a larger project. Our electricians have the judgment to realize this and give you an accurate estimate early on so that you can decide if you want to go ahead. Our electricians act professionally with your tenants. Our electricians have a friendly, professional manner with tenants. They have the training to give information to tenants on a need-to-know basis and know what to say and what not. For example, they start with something along the lines of: “The management company asked us to come out right away so that we can get your power back on.” They know not to mention to the tenants anything negative about the electrical in the unit and instead to let you know if they think something needs attention. Our electricians make sure that you know when the job is done. When our electrician finishes, he checks that everything works, cleans up after himself, and if the tenants are home, lets them know that the job is done. He also tells you. Our electricians keep you posted on the condition of the electrical in your units. Let’s say that you asked us to add a circuit for an appliance. Our electrician adds the circuit, but also notices that a bedroom has no smoke detector. Our electrician will let you know without saying anything to the tenant that would obligate you to do electrical work. Our technicians will always keeps an eye out for you so that you’re aware of electrical issues that he comes across. Our office provides you with timely, accurate invoices. We send out invoices when expected with the detail needed to provide you with a clear accounting for the property owners. We understand that you need smooth and simple paperwork along with a smooth and complete electrical job. During business hours, our office manager is always available to answer any questions about billing.